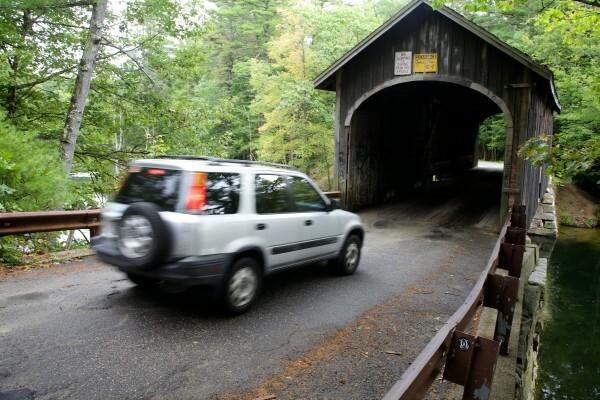 A car pulls enters Babb's Bridge from the Gorham side on Tuesday. The bridge, which joins Gorham and Windham over the Preumpscot River, recently had holes cut in the roof by vandals wanting to jump into the river. Police say Babb's Bridge, spanning the Presumpscot River between Gorham and Windham, recently had a hole cut in the roof by vandals wanting to jump into the water. The bridge was burned by vandals in the early 1970s and rebuilt in 1976. WINDHAM, Maine — A well-known local landmark in Windham has been vandalized. 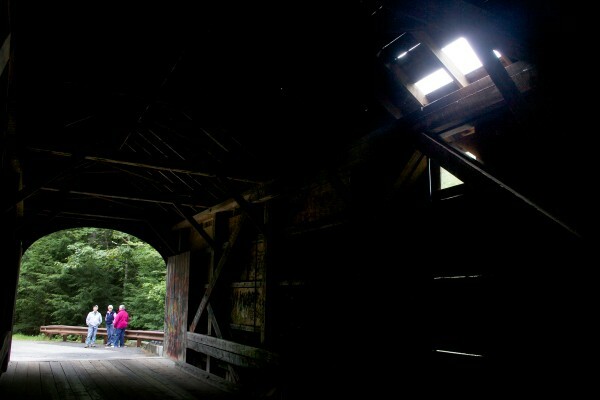 Someone cut holes in the roof of the Babb’s Covered Bridge, which has a history of vandalism, and police are investigating. The bridge was rebuilt in 1973 after arson destroyed the original bridge. Recent criminal activity has become a reminder of what happened four decades ago, which has people in the area frustrated. “It just seems very disrespectful because there is a lot of history to the bridge and it’s been here for a long time,” said Windham resident Shari St. Hilaire. Graffiti is the least of everyone’s concerns. People have put holes in the roof so they can climb out and jump down into the river below. Something locals and first time visitors just don’t understand. Jumping and diving clearly against the rules, but that’s not stopping some. If this keeps up, some worry how safe the bridge will be. Many suspect it’s all thanks to teenagers with nothing better to do. Policing responsibilities for the bridge are shared by Gorham and Windham police departments. Elected officials say if Babb’s Bridge is destroyed again, it could be very difficult to come up with the money to build another replacement.